I bet this kittie’s name is “Bill”. Back at Maricopa, we had a computer tech in the 1990s named Bill whose method of fixing a computer was to pop open the case and whack the hard drive with a screwdriver (ok, he did it once, I thought it was strange, but I think he fixed it). 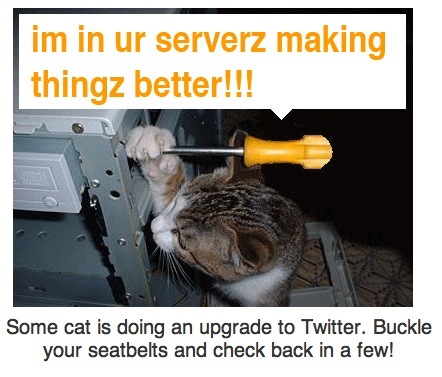 Cats in the server Grrrrrrrrrowwwwwwl. The screwdriver-whack trick worked — or at least it did in the late 1980s. That’s how I used to fix my uppity IBM PC. I once had a telephone tech support person guide me through a problem with a PC hard drive, in the days when 30 megabytes would cost about $300. At one point she had me nudge the bottom of some circular plate on the drive motor with the eraser end of a pencil.